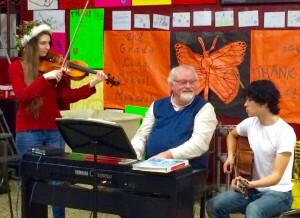 Rick playing with young musicians at a Christmas sing-along. Rick is a dedicated teacher and versatile musician. He teaches Music Theory, Interrelated Arts, Art Exploration, Chorus, Jazz Band, Orchestra, and Madrigals at University of Illinois Laboratory High School (Uni High) in Urbana. He has been involved with Illinois Summer Youth Music (ISYM) for decades, and is past-president of the Illinois Music Educators’ Association (IMEA). He earned his B.F.A. at MacMurray College and his M.M.Ed. at Illinois State University, and has completed all of the course-work in the music education doctoral program at the University of Illinois.